This dish will certainly leave an impression on your guests. The tender meat with the tasty sauce is perfect. If you prefer a smoother sauce, puree the mixture before thickening. Preheat oven to 375 degrees F. Remove meat from refrigerator so it can stand at room temperature for 30 minutes. Place shallots on a baking sheet and toss oil. Season with salt and pepper. Roast until shallots for 20 minutes. Add mushrooms and stir. Roast another 10 minutes or until shallots are deep brown and very tender. In a large saucepan, combine beef broth and port. Bring to a boil. Cook over high heat until the liquid is reduced by half, about 30 minutes. Whisk in tomato paste. Set aside. Pat beef dry; sprinkle with thyme, salt and pepper. In a large roasting pan, heat on the stovetop over medium heat. Saute bacon until golden. Transfer bacon to paper towels. Add beef to bacon drippings in roasting pan; brown on all sides over medium high heat, about 7 minutes. Transfer pan to oven. 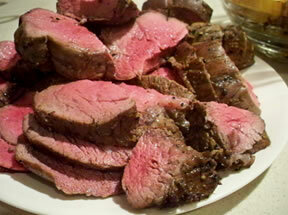 Roast beef until meat thermometer until desired doneness, approximately 25 minutes for medium rare. Transfer beef to serving platter. Tent loosely with foil. Mix half the butter and all of the flour in small bowl to form a paste. Spoon fat off top of pan drippings in roasting pan. Place pan over medium-high heat on stove top. Add broth mixture, and bring to boil; stir to deglaze the pan. Stir in roasted shallots, mushrooms and bacon. Season with salt and pepper. Whisk paste into broth mixture, and simmer until sauce thickens. Whisk in remaining butter. 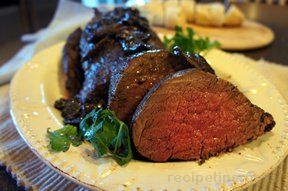 Serve thick slices of tenderloin with sauce.